While these days the number of mortgage products on the market appears to be back on the rise to meet the changing needs of borrowers, back in 2008 deals available through brokers were in decline. As the financial crash hit home, more and more loans were withdrawn, dropping 27 per cent in the month to April 2008. Predictions by Trigold’s David Alymer that the number of products seen pre-crash – a staggering 80,000 – would not be repeated have so far proved founded. 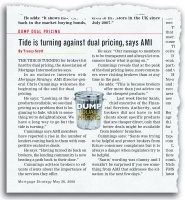 The Association of Mortgage Intermediaries was campaigning to end dual pricing this time 10 years ago. 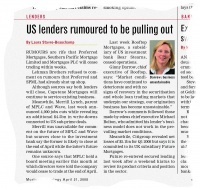 The then-director general Chris Cummings was optimistic that the practice was coming to an end and reported that lenders were increasingly offering exclusive deals to brokers. He pointed out that intermediaries offered more than just advice on the cheapest products – which is worth highlighting following the FCA’s interim report into today’s market that claimed consumers were losing money by going through brokers who used select lenders. Mortgage Strategy had its very own shadow monetary policy committee back in the day and it seems the panel of 12 had quite the knack for predicting the Bank of England’s decisions on base rate. In fact, in one year the panel got the decision right 12 times! 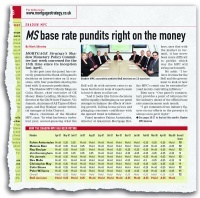 At this point 10 years ago, the base rate stood at 5 per cent, but by the same time in 2009 it had dropped significantly, to 0.5 per cent, where it stands today. Echoing the current unsettled buy-to-let climate, the industry was faced with many negative headlines back in 2008. However, the cause of the apparent decline was due to arrears and repossessions rather than regulatory intervention as is the case today. But those working in the sector were as keen as their colleagues today to not let the market be talked down and pointed out that there would always be a need for rental properties – as remains the case. A decade ago, trade bodies the Council of Mortgage Lenders and the Building Societies Association were both bidding to represent mutual lenders. The bodies learned to work in harmony over the years, with many lenders signing up as members of both organisations. Fast-forward and the CML no longer exists, having merged into UK Finance last year. The BSA, however, is still going strong in its original form.